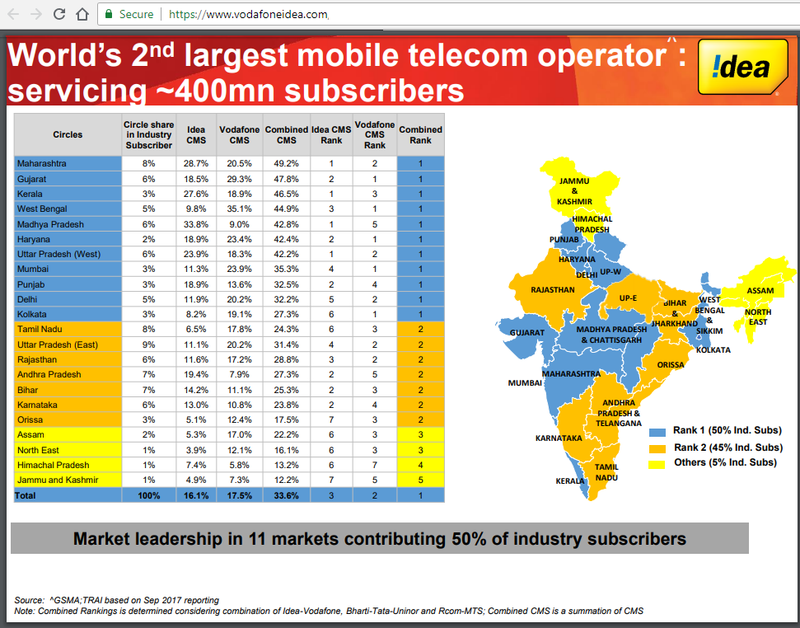 Idea Cellular and Vodafone India completed their merger, creating India's largest telecom service provider with over 408 million mobile subscribers, 340,000 sites, and 1.7 million retail outlets and 15,000 branded stores. The new company, Vodafone Idea Limited, is now operational and ranks as the No.2 operator worldwide by subscriber count, behind China Mobile. Its mobile network covers approximately 92% of India's population. Vodafone Idea is structured as a partnership between Aditya Birla Group and the Vodafone Group. 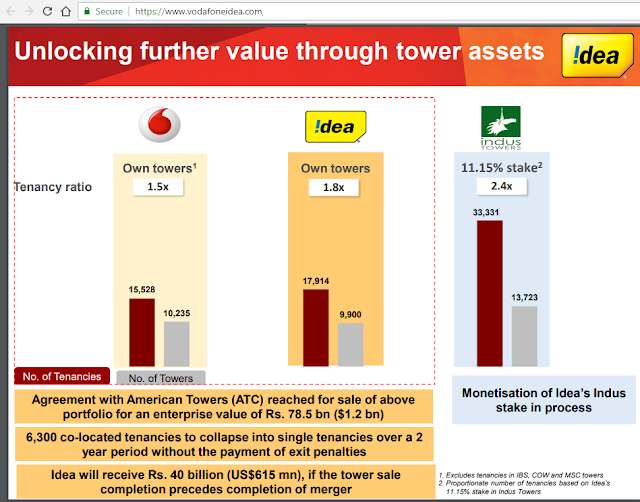 Following completion of a capital injection process, Vodafone will own a 45.2% stake in Vodafone Idea and Aditya Birla Group will own a 26.0% stake, both on a fully diluted basis. Vodafone will also separately hold a 29.4% stake in the combined entity resulting from the merger between Bharti Infratel and Indus Towers. 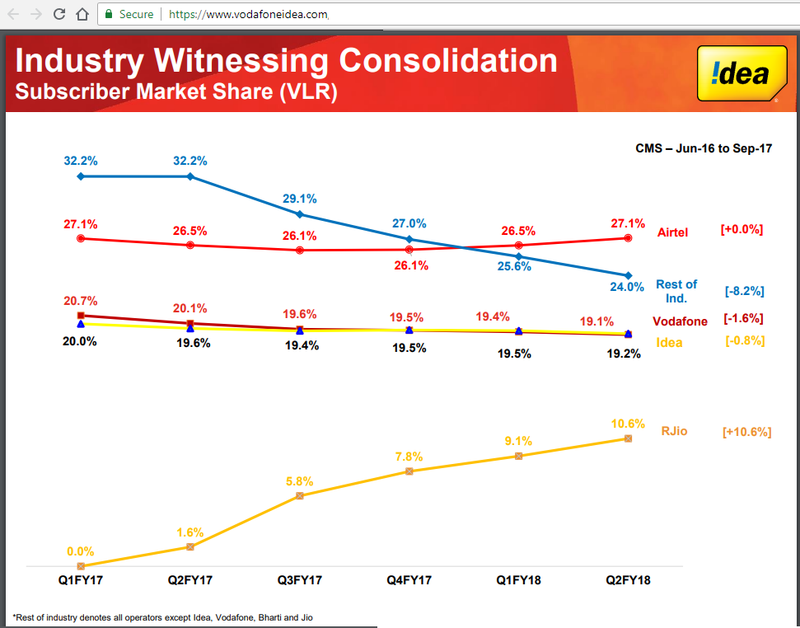 Vodafone Idea claims a #1 market share position in 9 of India's telecom circles, and 32% overall market share by revenue for all of India. In terms of spectrum, the company holds extensive 1850 MHz licenses and an "adequate number" of broadband carriers. It also controls about 235,000 kilometers of fiber. Both the Vodafone and Idea brands will continue to operate. Mr. Balesh Sharma has been appointed CEO of the business. "Today, we have created India’s leading telecom operator. It is truly a historic moment. And this is much more than just about creating a large business. It is about our Vision of empowering and enabling a New India and meeting the aspirations of the youth of our country. The “Digital India”, as our Honourable Prime Minister describes it, is a monumental nation- building opportunity," stated Mr. Kumar Mangalam Birla, Chairman Aditya Birla Group and Vodafone Idea Limited. The merger is expected to generate Rs. 140 billion annual synergy, including opex synergies of Rs. 84 billion, equivalent to a net present value of approximately Rs. 700 billion. The equity infusion of Rs. 67.5 billion at Idea and Rs. 86 billion at Vodafone coupled with monetization of standalone towers of both companies for an enterprise value of Rs. 78.5 billion, provides the company a cash balance of over Rs. 193 billion post payout of Rs. 39 billion to the DoT. Additionally, the company has an option to monetise an 11.15% stake in Indus, which would equate to a cash consideration of Rs. 51 billion7. 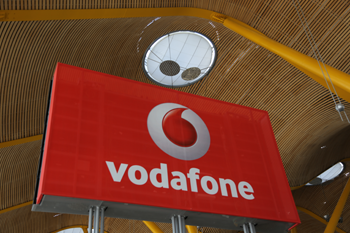 Vodafone India completed the sale of its standalone tower business in India to ATC Telecom Infrastructure Private Limited (a unit of American Tower) for an enterprise value of INR 38.5 billion (EUR 478 million). Vodafone India is merging with Idea. Both parties announced their intention to sell their individual standalone tower businesses to strengthen the combined financial position of the merged entity. Completion of Idea’s sale of its standalone tower business to ATC is also expected in the first half of this calendar year. Completion of Vodafone+Idea merger is expected to complete in the first half of the current calendar year. In June, Idea Cellular Ltd. received approval from India's Department of Telecom to increase the Foreign Direct Investment (FDI) limit in the company to 100%. Previously, it faced a 67.5% limit. 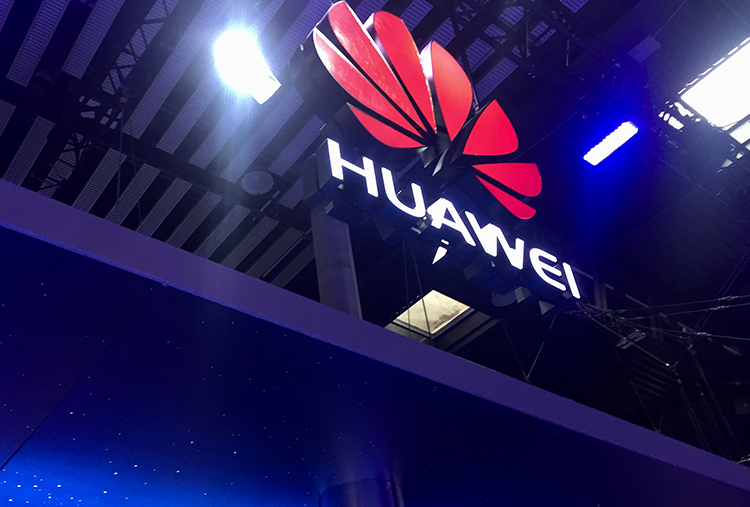 Vodafone recently completed the second phase test of Huawei's cloud-based Broadband Network Gateway (BNG) solution in a fixed broadband scenario. Phase II testing covered access, authentication and accounting for home broadband users in various scenarios. It also included performance, reliability and security testing of cloud-based BNG systems. Vodafone and Huawei verified functionality of the cloud-based BNG solution using virtual network functions (VNFs) as the control plane and also using physical network functions (PNFs) as the user plane. 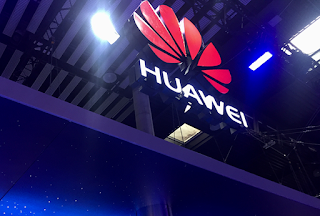 Huawei says its BNG solution features a Control & User Plane Separation (CUPS) architecture, which decouples the control and user planes of traditional BNG architectures. The control plane integrates the user management functions of multiple BNGs and shifts their resources to the cloud. 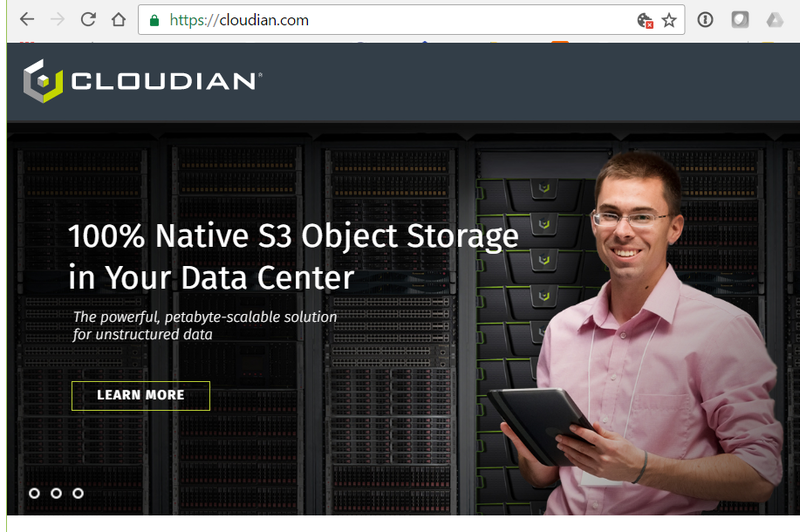 In addition to automated service provisioning and network O&M, the solution deployment in the cloud also enables global resource sharing, elastic capacity scaling, flexible architecture adjustment and network capability exposure.